The religious texts of Ancient Egypt mention the fact of pulling from the lock of hair with the locution nwn m. We usually considered this gesture as “pulling the front lock of hair”, due to the act that the artists of Ancient Egypt depicted the mourners always pulling from a lock of hair that hanged from their front. At left of the image in a smaller scale a mourning woman pulls with both hands not from a front lock of hair, but from a lateral lock of hair. Her face is depicted from a frontal point of view and maybe for that reason the artists of Ancient Egypt could draw the gesture this way. She is making the nwn m gesture, but in a different way the canonical tradition depicted. The nwn m gesture referred not just to the fact of pulling a front lock of hair, but any lock of hair. 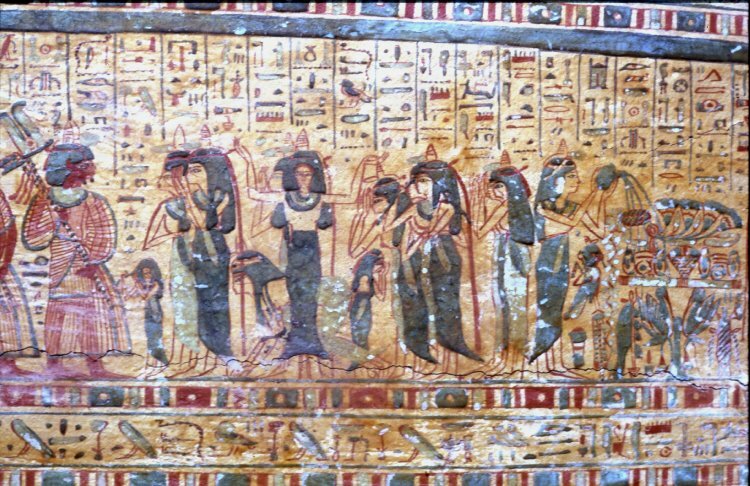 The mourners in Ancient Egypt just pulled from locks of hair. These locks did not need to be frontal. The way the art of Ancient Egypt depicted the human body in two dimension did not include usually the frontal perspective, so heads were always drawn in profile. That obligated the ancient Egyptian artist to represent the nwn m gesture of pulling from a lock of hair as if the mourners pulled from a front lock of hair. The introduction of the frontal perspective in this mourning scene was an innovation, so the artists also innovated in depicting the mourning gesture of puling from a lock of hair from an unusual point of view.